The idea of delivering mail to lakeside homes by jumping from a boat to a dock and back again likely would have made Mark Twain chuckle. In this month's edition, you'll hear about Wisconsin youths whose summer job is to stay dry while jumping from a moving boat to deliver Lake Geneva residents' mail. You'll also hear a Mark Twain impersonator's ruminations on the new commemorative stamp issued in honor of the creator of Tom Sawyer and Huckleberry Finn. The show also features a roundup of the latest Postal Service news and announces the winners of last month's Owney book drawing. Click here to see a transcript of this month's podcast. 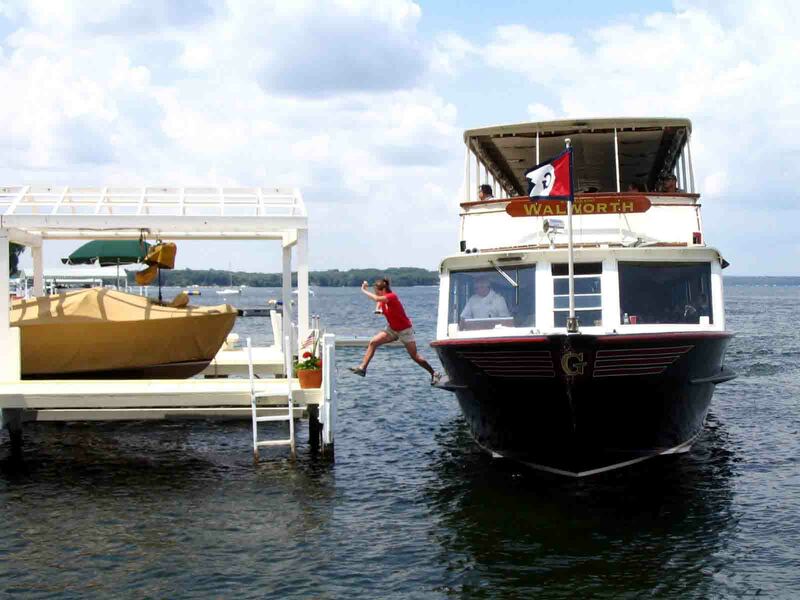 Photo: A mail jumper makes a delivery to a Lake Geneva resident's boat dock. Click here for a transcript of Your Postal Podcast v. 39.